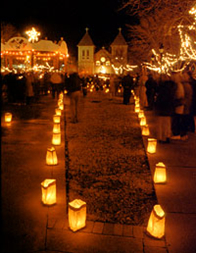 2nd Annual Hollis Town Luminary – We’ll make the town glow! During the day we’ll assist with the setting out, and lighting, of candles in the town center ready for Santa’s procession to the Lawrence Barn. We will decorate the barn and serve refreshments while the children greet Santa before the Hollis Town Band performs at the High School. Magical family event. Come and see Santa travel through the square.